Slammed by critics for his landlord roots and rich kid fascination for luxury cars, President Benigno Aquino III is increasingly being perceived as having no concern for the poor. When he promised change during the campaign, many voters apparently believed him. But more than half a year since Aquino became the Chief Executive, the only substantial change that the people have seen so far is the drastic increase in prices of almost everything. Inflation in January recorded 3.5 percent, the fastest since August last year, said the National Statistics Office (NSO). While Malacañang has expressed concern over the sharp rise in prices, alas it does not intend to directly intervene. It merely said that the Bangko Sentral ng Pilipinas (BSP) has to manage inflation through setting of the official interest rate. Setting higher interest rates, for instance, is expected to limit money in circulation and thus temper demand and prices. But the impact of the central bank intervention on ordinary consumers is uncertain and possible benefits are further down the line. The BSP itself as well as the National Economic and Development Authority (NEDA) aren’t very worried and predicted a worst-case inflation of 5 percent this year. Overall, the Aquino administration has remained passive on the issue of high prices despite warnings including from the United Nations’ (UN) Food and Agriculture Organization (FAO) that the skyrocketing costs of basic goods could fuel unrest. Hunger riots have already erupted around the world and, in Tunisia, even led to the ouster of its current government. Indeed, in poor countries like the Philippines, where some 3.4 million families experience hunger, said a recent survey, high prices easily become a political issue. At the same time, it also highlights the basic flaws in the kind of economic policies being espoused by the Aquino administration, which continues the past governments’ bias towards so-called market forces, the interest of private investors, and minimal state intervention. Thus, the situation today requires much more than asking the central bank to manage inflation. Drastic political action is needed for immediate economic relief. Otherwise, Aquino’s much-touted high political capital will be eroded rather quickly amid the growing public perception of his ineptness in running the country and in addressing the poverty that grips a great majority of the people. How much have prices increased since Aquino took over? 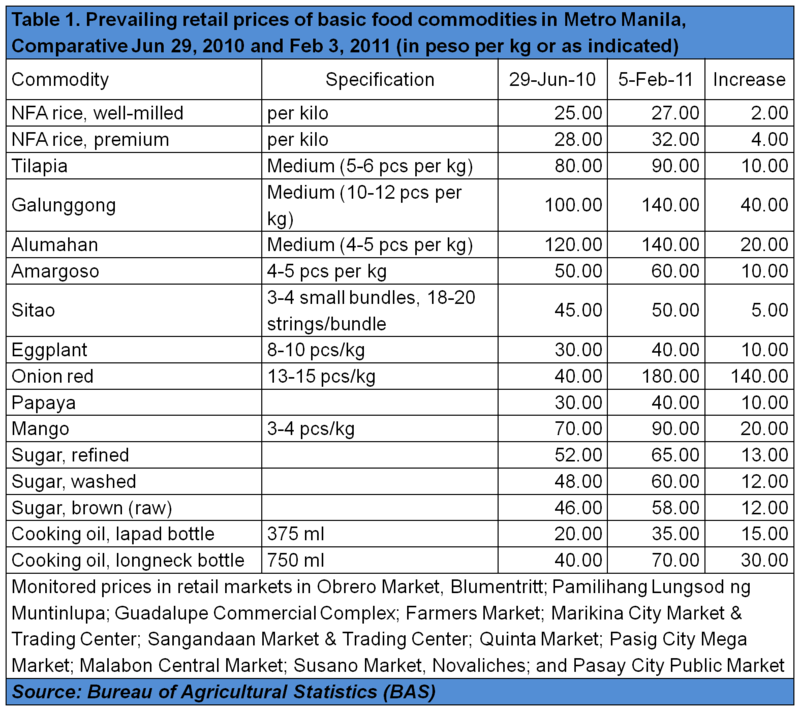 A comparison of the retail prices of basic food commodities in Metro Manila shows a steep hike between June 29, 2010 – a day before Aquino’s inauguration – and February 5, 2011, which is the latest monitored date by the Bureau of Agricultural Statistics (BAS). This week, oil companies have again raised pump prices by P0.75 a liter for diesel and gasoline and P1 for kerosene. Like its immediate predecessor, the Aquino administration claims it is helpless since local prices are supposedly dictated by the global oil market, which has been seeing an astronomical rise in prices similar to the situation in 2008. 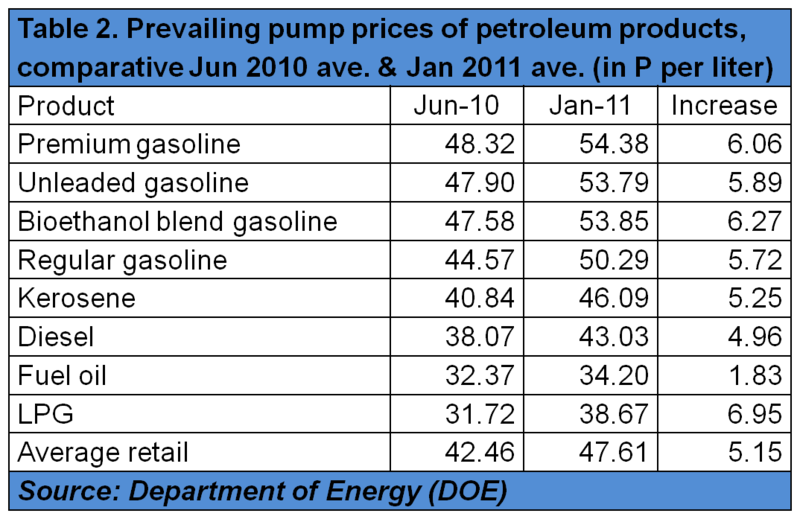 Apart from publishing on the Department of Energy (DOE) website the formula in computing price adjustments, government has not taken a more proactive stance in ensuring fair oil prices despite persistent allegations of overpricing. While the President has indicated that he is open to amending the Oil Deregulation Law (Republic Act 8479) and study further factors affecting prices, this was not included in the list of priority bills that Malacañang recently bared. Another aspect of high prices under the Aquino administration is the extraordinary increases in the rates being charged by almost all utilities – from water and power to toll and mass transportation fares. Aquino, of course, can claim that these increases are the result of privatization obligations forged and petitions approved long before his administration came to power. But Malacañang chose to justify these increases, calling for instance the increase in water rates and jeepney fares “minimal”. But the largest increases are being felt by motorists that regularly use the South Luzon Expressway (SLEX). After a prolonged court battle, the South Luzon Tollway Corp. (SLTC), which is owned by Malaysian investors, has finally been allowed by the Supreme Court (SC) to increase tolls at the SLEX by 300 percent. 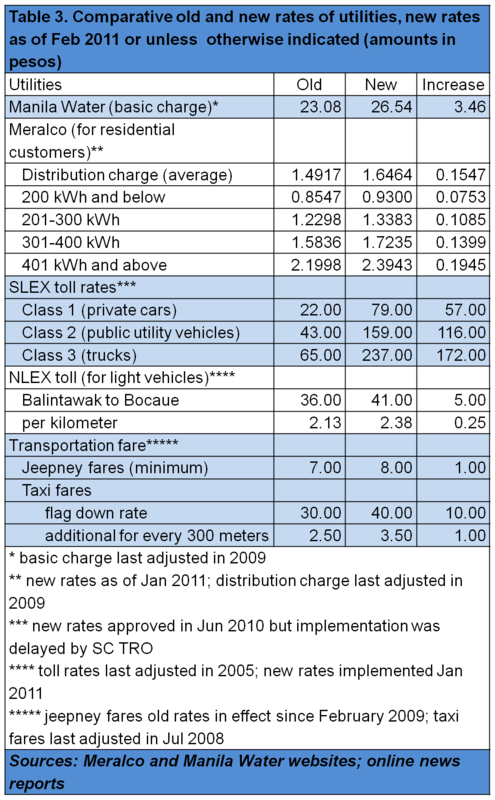 As of February, SLEX toll rates have jumped by 259 to 270 percent from its previous level with the full increase to be implemented by April. This kind of situation, where investors’ profits are undermined by regulatory intervention such as by the judiciary, is the circumstances that the President wants to address with his so-called regulatory risk guarantee. “If private investors are impeded from collecting contractually agreed fees by regulators, courts, or the legislature, then our government will use its own resources to ensure that they are kept whole,” Aquino said in his speech at the public-private partnership (PPP) summit last year. Aquino first hinted his intention to raise the fares in LRT and MRT in his State of the Nation Address (SONA) last year when he accused the Arroyo administration of artificially lowering the fares for political brownie points. 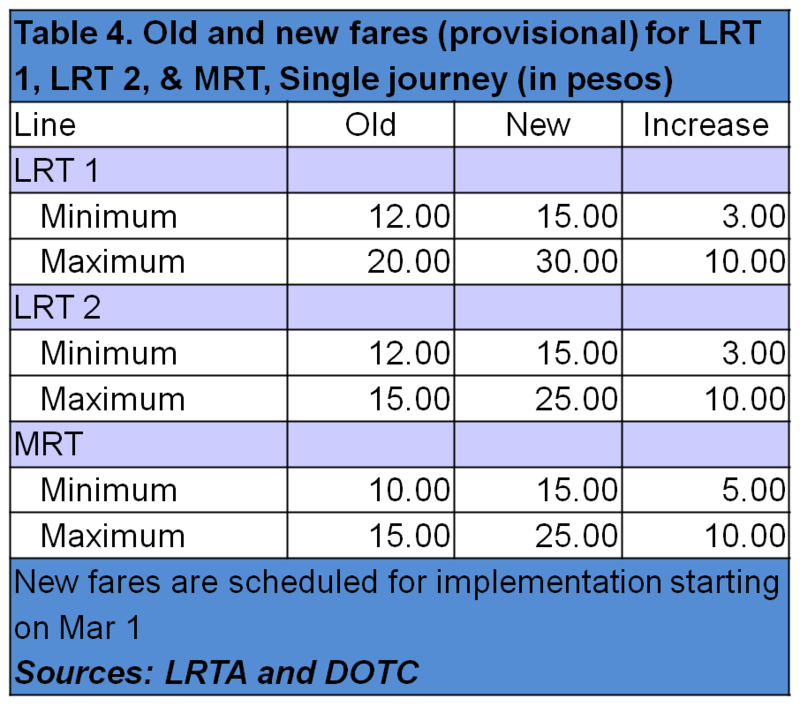 Consistent with Aquino’s PPP scheme, the LRTA-DOTC, in a study, has said that the fare hike is intended to “send clear signal to private sector investors that regulatory risks will be minimized in future public-private partnership projects”. Groups opposing the fare hike, meanwhile, have pointed out that the increase is meant to pass on to the commuters an increasing portion of the LRT and MRT’s debt burden, which includes onerous loans and contractual obligations. Despite widespread opposition, as shown during the two-day public consultation, it appears that the authorities will go ahead with the fare hike. More than a million daily commuters – of whom 8 out 10 are ordinary workers and students – will shoulder the fare increase. There is a clear and urgent need for the Chief Executive to exercise his vast political power and influence to protect the people from the prevailing regime of high prices. Indicators show that the situation will not ease soon. Global oil prices, for example, will continue its uptrend as the world market is again facing massive speculation due to the tension in Egypt (2-3 million barrels of oil pass through its Suez Canal). Aquino could not rely on his controversial P21-billion conditional cash transfer (CCT) program or the Pantawid Pamilyang Pilipino Program (4Ps). This program, which covers only less than half of the poor as measured by government, also excludes millions of families who are not poor by official standards but still feel the impact of high prices. Authorities, for example, are reportedly considering the CCT to cushion the impact of the LRT and MRT fare hike on the poor. 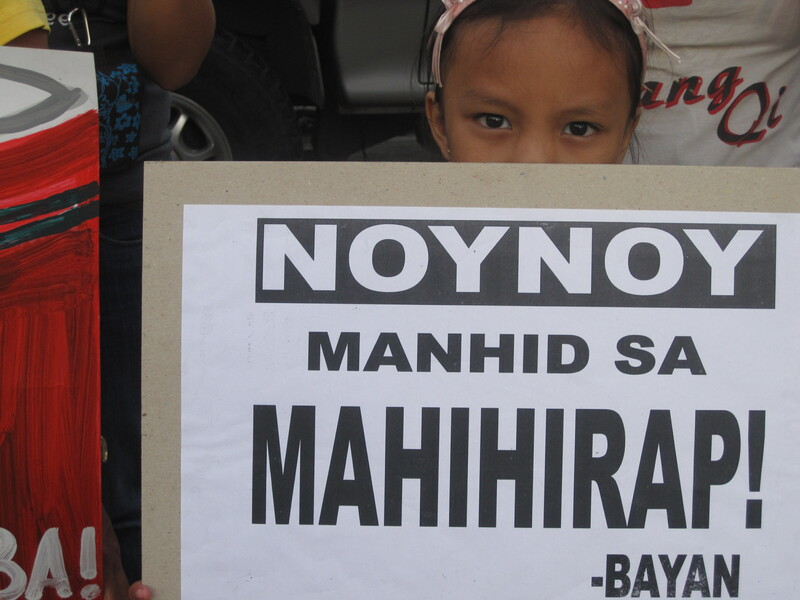 However, a great majority of CCT beneficiaries who are extremely poor does not even use the LRT and MRT. There are immediate solutions which only require political will and genuine concern for the poor. For one, Aquino can withdraw his order to increase the LRT and MRT fares and direct the NFA to roll back the retail prices of its subsidized rice. Another is to impose a price cap on prime commodities, especially food, which the President has the authority to do under the current Price Act (RA 7581). Lastly, he can suspend the collection of the 12 percent value added tax (VAT) especially on oil products and electricity and convince allies in Congress to repeal the Oil Deregulation Law and the Electric Power Industry Reform Act (EPIRA or RA 9136), which allowed utility rates to soar.